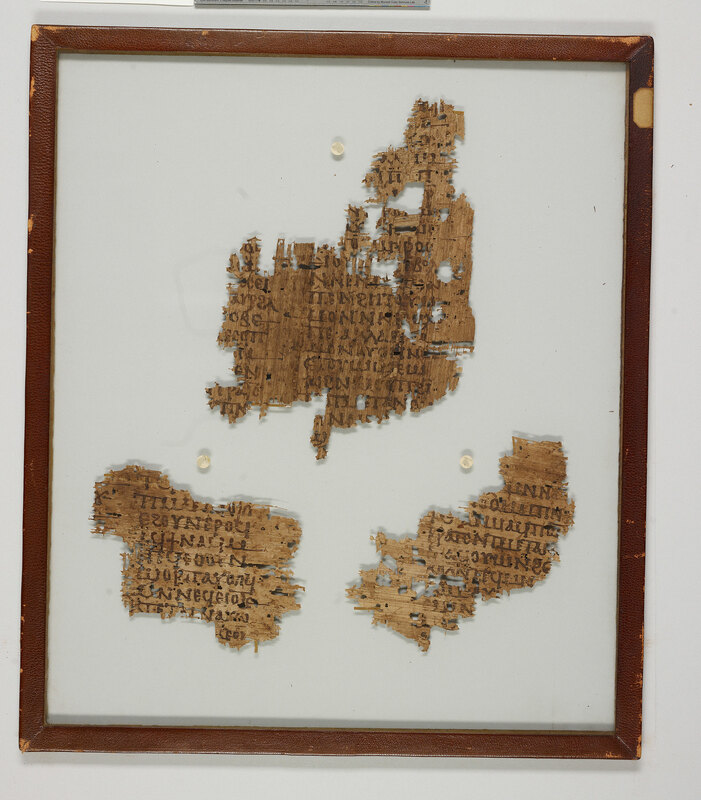 Manuscript fragments of a Homily on Isaiah 1:16-18a and on St. Michael Archangel on four leaves from a papyrus homiletic codex that is attributed to Demetrius of Antioch; written in Egypt. "A homily which St. Apa Demetrius archbishop of Antioch, who had ordained the great John (Chrysotom) a priest, delivered. He delivered it about the word which Isiah said, 'Wash yourselves, purify yourselves, remove those evil things from your heart away from my eyes, cease to do evil things, learn how to do good, search for justice, save the oppressed, be just to the orphan, plead for the widow, and come and make peace with one other,' said the Lord, etc. He also spoke in this same homily about repentance. He revealed the life of pious people. They became elect in the end through repentance. In God's peace. Amen." Edited and translated into English by Crum. According to the Coptic Encyclopedia (1991) Demetrius of Antioch is a fictitious character created by the originators of a literary cycle during the late period in Coptic literature. 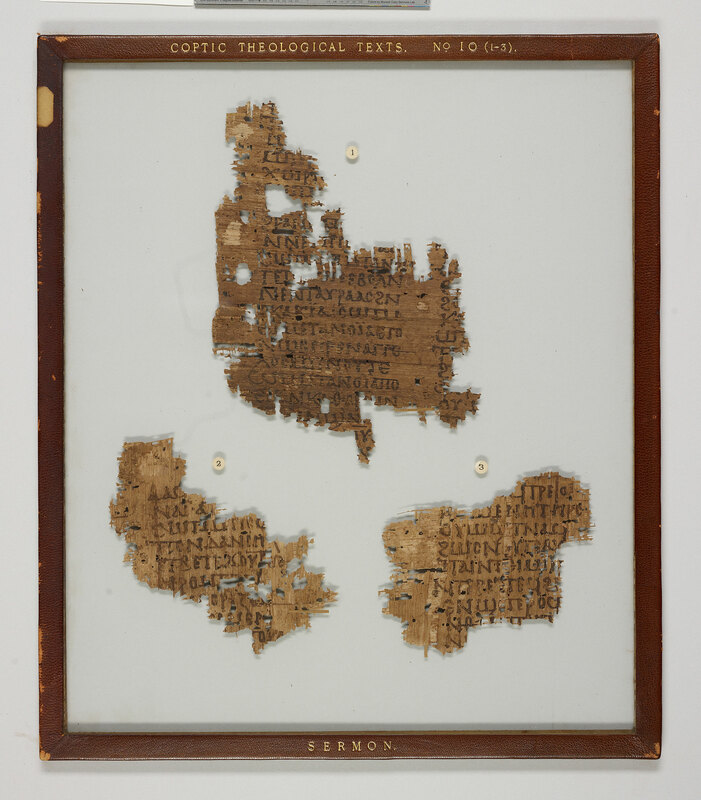 The text of the present manuscript is referenced there as "In Isaiam I:16-17." Divisions: Slightly enlarged initial and paragraphus sign (simple diple) setting off paragraphs. "Bohairic parallels are Vat. copt. 67, fols. 110-139 (nearly complete) edited and translated into French by de Vis (1922-1929), vol. 1, p. 129-197 (Cf. Hebbelynck-van Lantschoot (1937), p. 497-499), and a Turin manuscript (fragmentary) edited and translated into Italian by Rossi (1893-1894), p. 303-317 (text), p. 330-335 (translation). On the basis of a comparison of the quotations from the Bible, de Vis, ibid., 128 concludes that the Bohairic very literally follows a Sahidic Vorlage. The text of C.10.4 is omitted in the Turin manuscript, that of C.10.1 wanting or omitted. The parallelism between the Morgan Sahidic and the Bohairic manuscripts was established by van Lantschoot, ibid., who also identified 4 leaves as related fragments of Vat. copt. 67, namely Cairo No. 109 (2 leaves) edited by Evelyn White (1926-1933), vol. 1, p. 141-142 (identified as a parallel of the above-mentioned Turin manuscript by Crum apud Evelyn White), and manuscript Tischendorf 24 (Leipzig), fols. 40 and 42; van Lantschoot gives the order of the leaves as follows: Vat. copt. 67, fols. 110-137 + Tischendorf 24, fol. 42 + Vat. copt. 67, fols. 138-139 + Cairo No. 109 + Tischendorf 24, fol. 40."--Cf. Depuydt, 221-222.